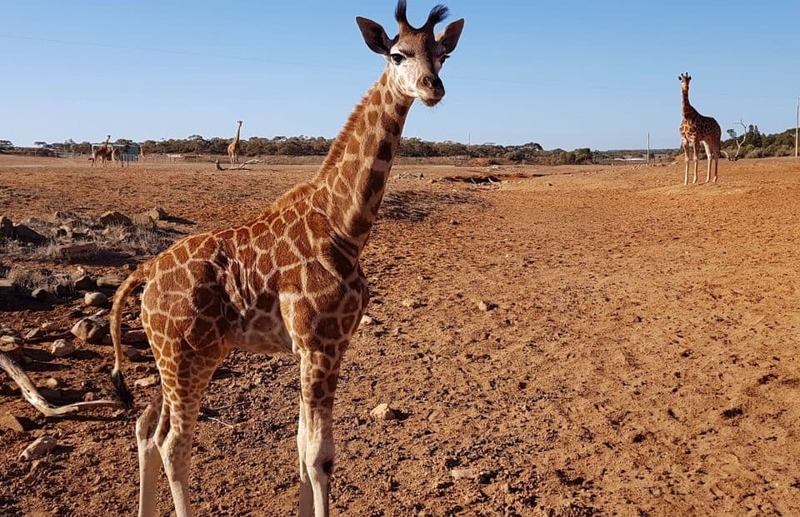 After a tough start to life being rejected by her first-time mother, Monarto Zoo’s newest adorable giraffe calf is finally ready to re-join the herd. Affectionately known as ‘Eyelean’ to keepers, the little giraffe calf has been thriving under the watchful eye of her keepers over the past three months after the decision was made to hand raise her. 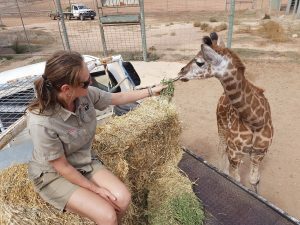 Monarto Zoo Keeper Tess Stevens said successfully hand raising a giraffe calf and returning her to the herd was a huge milestone for the keeping team. “We’re all absolutely thrilled with her progress – she’s healthy, strong and ready to mingle with the rest of our giraffe herd,” Tess said. “It’s not very common to hand raise giraffe calves because it can be quite challenging and labour-intensive. “Over the past three months, it’s been all hands on deck as we acted as her surrogate mum and we couldn’t be more excited she’s re-joining the herd. Recently, keepers have been preparing the little calf for integration into the Waterhole habitat by teaching her to bottle feed and eat browse from the back of their utes. “This gives us confidence she’ll still come over to us for the milk and food she needs to stay in tip top shape,” Tess said. “She’s been enjoying regular contact with the rest of the herd through a fence and loves getting her face and horn tufts licked by one of our female giraffes, Asali. “Although we develop special bonds with our animals, we’ve been careful not to become too close because hand raised giraffes can become dangerous and difficult to handle as they grow older. The young calf was removed from the herd and underwent intensive treatment after suffering mis-mothering from her first time mum, Thula. “We monitor our first-time parents very closely and unfortunately it seemed her mum Thula wasn’t taking to motherhood particularly well,” Tess said. “When Eyelean would approach her mum for milk, Thula would respond by kicking out at her and not allowing her to feed. “We were then faced with the crucial decision of whether to intervene and remove the calf from the herd to hand raise it – knowing full well if she continued to be neglected by her mum, she wouldn’t survive the night,” Tess said. After much medical and animal husbandry consultation, the decision was made to transfer the baby giraffe to a holding shed for intensive management. “After we retrieved her, we found she had a swollen eye and a disjointed neck that had a bit of a lean so we affectionately nicknamed her ‘Eyelean’,” Tess said. Classified as vulnerable to extinction in the wild, ‘Eyelean’ marks an important contribution to a vital breeding program working to secure the future of the world’s tallest animal, which is facing an uncertain future in the wild. Habitat loss, poaching and civil unrest has seen giraffe numbers plummet from around 155,000 in 1985 to just 97,000 in 2015. This equates to a decline of almost 40 per cent over three giraffe generations. This startling and devastating decline saw the giraffe reclassified as vulnerable to extinction last year by the International Union for the Conservation of Nature (IUCN). As a conservation charity, Zoos SA is committed to continuing our successful breeding program to ensure generations to come can enjoy the wonder of these tall, gentle creatures. 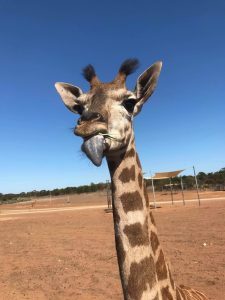 Monarto Zoo is proud to be the most successful giraffe breeding facility in Australasia, with the not-so-little bub marking the 44th calf to be born at the zoo.